After a top year of sell-out dates and three consecutive releases entering into the Beatport Top 10, Showtek recently took their unique sound to the charts to co-produce the future Chris Brown smash ‘Nobody’s Perfect’. Now they have joined forces with Bassjackers, continuing their Crazy Collab series that has already seen them team up with Tiësto and Hardwell for the first two releases. Following on from the success of their single ‘Mush Mush’ in 2011, and recent releases including the single ‘Let’s Get Weird’ as well as remixes for the likes of Spencer & Hill and pop megastar Enrique Iglesias, Bassjackers have spent 2012 on fire with their tours and releases. 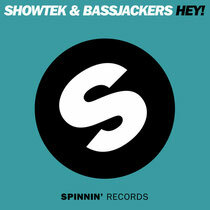 Now the two dance music duos release ‘Hey’ through Spinnin’ Records on 31st December. The track’s trance infused intro builds into a hard-as-nails electro drop and it’s already built up support from DJs such as Tiësto, David Guetta, Calvin Harris and Dada Life in addition to it heading straight into DMC Magazine’s buzz chart at #2. Check it out below.